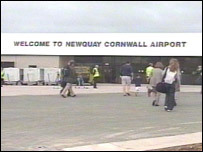 A campaign to safeguard the future of Newquay Airport in Cornwall is being launched by local authorities. The threat to the airport has been prompted by fears that RAF St Mawgan could be closed or downgraded. Cornwall County Council says senior government ministers must realise the airport will be unsustainable if St Mawgan closes. The council owns the civil airport but air traffic control, runway maintenance and fire cover is provided by the RAF. The authority is to mount its campaign working with the Cornwall and Isles of Scilly economic forum. 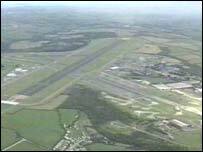 The council says Plymouth City Airport could also be at risk if Newquay is in trouble. However, BBC South West Business Correspondent Neil Gallacher said staff at Plymouth Airport have downplayed any possible effect. He said: "They say some Cornish passengers would probably drive to Plymouth if Newquay closed; and that Plymouth also offered six other scheduled destinations that were nothing to do with Newquay." In July, Defence Secretary Geoff Hoon announced that training and headquarters units for St Mawgan's 203 Squadron are to move to Anglesey and engineering work will be put out to commercial tender. At the moment flights are carrying on as normal at Newquay Airport which currently handles nearly 250,000 passengers a year and is served by Ryanair and Air Southwest. Flying from Newquay is something many Cornish people now take for granted and several said they did not want it taken away. One male passenger flying on Friday said: "I think it should be expanded more than cut down. "It's one of the biggest tourist areas in the country and we haven't got a big airport down here. The nearest is 200 miles away." The chairman of the county council's executive committee, John Lobb, said: "We're making every effort to promote the viability of Newquay Airport. "We are obviously looking at additional routes, and we are trying to get across the vital part the airport plays in our county's economy - and the adverse effect it would have if it were to be lost to us."